Five months after NASA’s New Horizons spacecraft flew past Pluto to take the first images and measurements of this icy world, knowledge about this distant system continues to unfold. New Horizons science team members are highlighting the latest findings from the Pluto flyby at this week’s American Geophysical Union (AGU) fall meeting in San Francisco. Among the highlights are insights into Pluto’s geology and composition, as well as new details about the unexpected haze in Pluto’s atmosphere and its interaction with the solar wind. “We’re much less than halfway through transmitting data about the Pluto system to Earth, but a wide variety of new scientific results are already emerging,” said New Horizons Principal Investigator Alan Stern of the Southwest Research Institute in Boulder, Colorado. Geological evidence has been found for widespread past and present glacial activity, including the formation of networks of eroded valleys, some of which are “hanging valleys,” much like those in Yellowstone National Park, Wyoming. 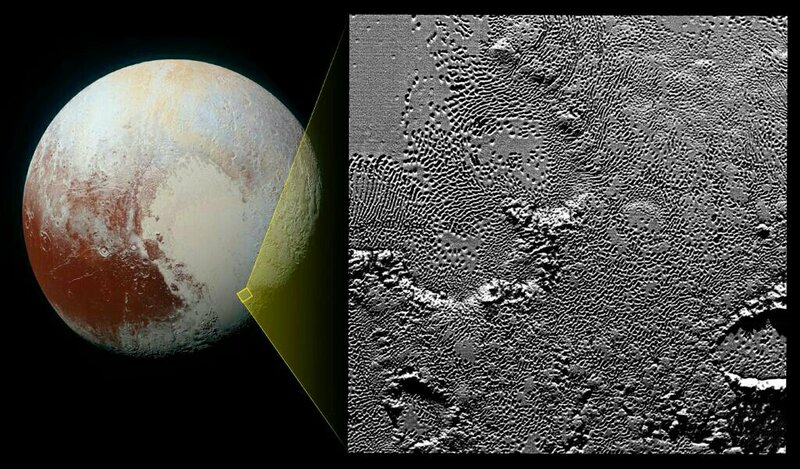 “Pluto has greatly exceeded our expectations in diversity of landforms and processes — processes that continue to the present,” said Alan Howard of the University of Virginia, Charlottesville, a scientific collaborator with the New Horizons’ Geology, Geophysics and Imaging team. This newly released image from NASA’s New Horizons spacecraft is the highest resolution image ever obtained of Pluto’s heart-shaped region. Key to understanding activity on Pluto is the role of the deep layer of solid nitrogen and other volatile ices that fill the left side of Pluto’s ‘heart’ — a vast, 620-mile (1,000-kilometer) -wide basin, informally named Sputnik Planum. New numerical models of thermal convection within this ice layer not only explain the numerous polygonal ice features seen on Sputnik Planum’s surface, but indicate this layer may be up to a few miles thick. Evaporation of this nitrogen and condensation on higher surrounding terrain leads to glacial flow back toward the basin; additional numerical models of nitrogen ice flow show how Pluto’s landscape has been and is still being transformed. In the last few months, New Horizons has also returned a multitude of color and phase-angle data on the remarkable atmospheric haze that surrounds Pluto, rising hundreds of miles or kilometers above the surface. In addition to assessing its optical properties, the science team is examining several important questions about Pluto’s extensive haze: where it originates, why it forms layers, and how it varies spatially around Pluto. New Horizons has also found new and more stringent limits for an atmosphere on Pluto’s largest moon, Charon. Moreover, scientists studying infrared spectral observations of Charon from the LEISA instrument aboard New Horizons are reporting evidence that ammonia (NH3) absorption occurs at a low level across a large portion of Charon’s surface, not just the high local concentrations that had been previously detected in a few locations. One of those, the informally named Organa Crater, had been noted as being especially rich in NH3. It’s not yet known what controls the distribution of Charon’s NH3, or if it comes from Charon’s interior or an external source. 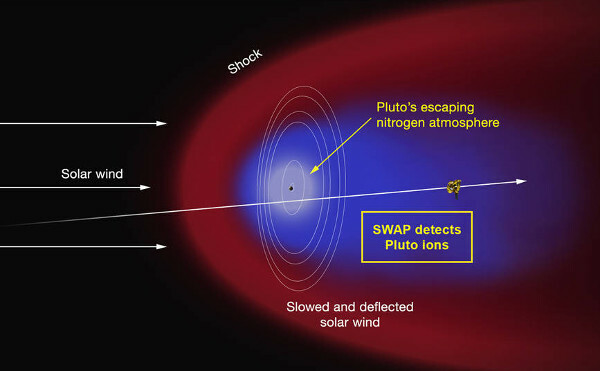 New Horizons scientists are also presenting findings about how Pluto and its moons interact with the solar wind, a constant stream of particles and plasma that flows from the Sun and is still traveling at 900,000 miles per hour (1.4 million kilometers per hour) at Pluto. Pluto’s outflowing atmosphere provides a source of neutral atoms that can exchange electrons with the solar wind’s positively charged atoms of oxygen (O), carbon (C), and nitrogen (N). Observations from the Earth-orbiting Chandra X-ray Observatory during closest approach contributed to scientists’ understanding of the processes at work. Team members searched for X-ray emissions near Pluto to help determine the rate at which Pluto’s atmosphere is being lost to space, in much the same way X-ray emissions are used to characterize the outflow of material from comets. How Big Can A Black Hole Grow?